You know those days when nothing seems to go right and everything is upsetting? That’s the kind of day I’m having so far. It’s only 1pm and I’ve already spent too much of today crying. It’s this kind of day that I especially need to take care of myself. I was going to go hang out with my boyfriend, but as much as I want to see him, I know that I need to spend the day relaxing at my own house. It was a tough decision to make, but I need to do what’s best for me at the moment. Today I’m sitting on the couch with cozy blankets, watching Netflix, and coloring. 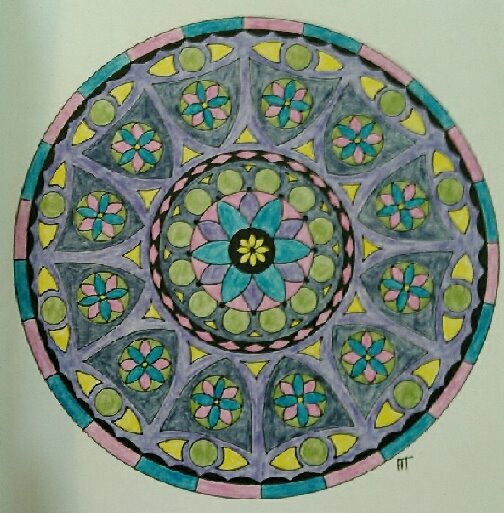 I recently bought a coloring book of mandalas, and it’s so relaxing and fun! I definitely recommend coloring as a way to relax yourself. How do you cope with bad days? Leave a comment! This entry was posted in My Story and tagged coping, end the stigma. Bookmark the permalink.